The southernmost extremity of the Black Combe massif is a spur above Silecroft village. The top of the spur is a wide flat area and the WSW face provides good soaring conditions. The key road is the A595 from Greenodd to Whitehaven. Coming from the east, 500m before the T junction with the A5093 from Millom at Silecroft, look for a lane by Whicham church on the right. Drive about 150m up the stone track that goes around the back of Kirkbank. Park at a small parking area on the right at the end of the walls. Limited parking so please park considerately. Better to park at Whicham church and walk the extra 400yds. Alternatively turn right at the garage and drive for 1km or 1500m and look for the 2 laybys. The northerly layby is by the track to take off. From the north, continue through Bootle - look for the layby where the hill gets very close to the road as you approach Silecroft. The path from the second (larger) laybye goes up the hill keeping the wood on one's left (outside the field). The path is well marked and can be seen on the 1:25000 map and on Google Earth. Take off is the large flat area at the top of the spur. From the easterly parking area, follow the main track up the fell to the right. It keeps above the fell wall and moves towards Moorgill Beck. After around 400m, turn sharply left up the hill; the main path continues up Moorgill Beck. Follow the zigzag up the hill to takeoff. , I think that the map shows the path going through the field which is now full of poultry. This is an open fell site but if you intend to land in the valley, you need to get permission first. If you are considering a bottom landing then check with Townend Hall if you're using the westerly landing area. If the wind is towards the SW it can get rougher. The take off area has a large top landing area but be careful of going too far towards the back as you will hit rotor. Do not try to land in the east unless the wind is WSW. If it's more to the north, the landing is likely to be unpleasant. However, the eastern landing field is very enticing if you used the eastern parking area. Super on a good day when smooth lift comes straight off the sea. An attractive site if you want to avoid a big carry up. Limited, due to the proximity of the coast. 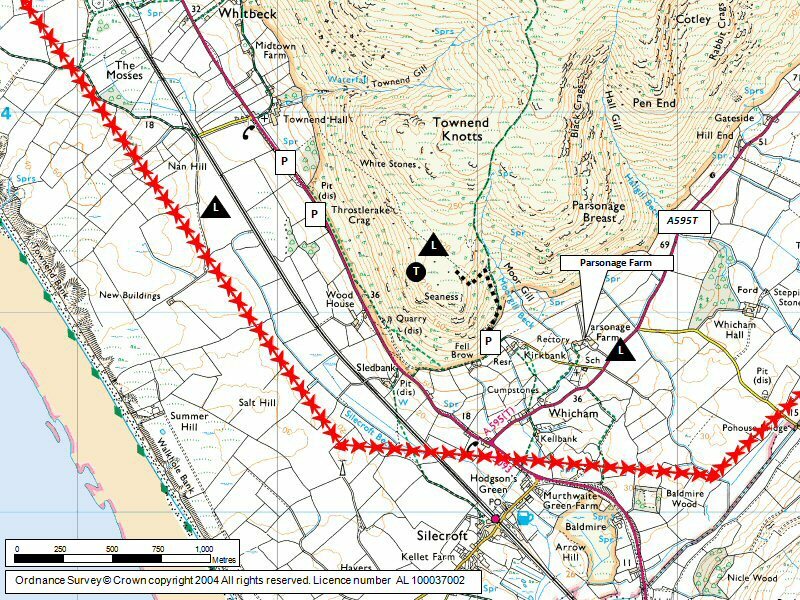 On a good day, it should be possible to work northwards to the Black Combe (West) site.